I still have a nice supply of good tea, from my husband's generous gift last Christmas. However, I've been fancying a cup of orange and spice flavored black tea, reminiscent of Constant Comment, if you're familiar with that tea. Here in the Seattle area, there's also the well-known Market Spice tea, I believe named for the Pike Place Market. Anyway, it's a nice orange, spice and black tea blend, perfect for a chilly autumn afternoon. In the Northern Hemisphere, we are about to enter the fresh orange season. Oranges may be available year round, but in late fall and early winter I often find them at rock bottom prices. If you remember, I use my orange peels extensively. I infuse vinegar with the peels. I make candied orange peel in sugar syrup. And I zest the oranges (using a veg peeler and my food processor), to save in the freezer for baking and tea. Our limited grocery budget now means that my afternoon tea has to either come from my current supply, or be cheap, cheap, cheap! 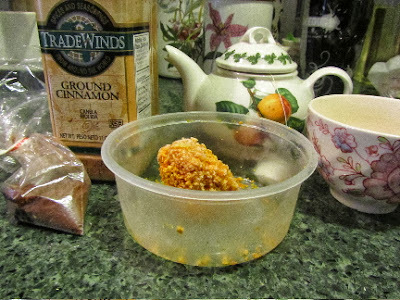 Here's my version of orange-spice tea, using dollar store black tea, orange zest, ground cloves and cinnamon and a bit of sugar. In a small teapot (about 10 oz. ), I infuse about 1/2 teaspoon of frozen orange zest in a full pot (10 oz) of water. I do this by microwaving the water and orange zest for about 1 minute 20 seconds. The orange zest is slower to infuse than tea, so I give it this first infusion. Next, I add 1 cheapo black tea bag and a tiny pinch of ground cloves, plus 1 slightly larger, but still tiny, pinch of ground cinnamon. I microwave this infusion for about 40 seconds, and allow to steep for a minute or two. I add a bit of sweetening (sugar, stevia or honey), and reheat my infusion, as needed. I have 2 lovely teacups of orange-spice black tea, for the cost of a cheap bag of black tea, a penny's worth of sugar and spices, and the zest of an orange that I might otherwise consider as garbage. You can bet that this year, of all years, I'll be making the most of every last orange peel that comes my way. I still have a small amount of zest and candied orange peel in the freezer from last year, but that supply is going fast. I used some of the orange zest in a batch of cookies this past weekend, along with chopped dried cherries, pecan pieces, nutmeg and chocolate chips. Oooh yum! I'm glad that it's cookie baking season again! That sounds better than any store-bought tea! I've been drinking a lot of tea, myself, lately. The government is open! I just kissed my hubby on his way to work, put the kids on the bus, and broke into the Hallelujah Chorus. Hooray! I thought about you and the many others who've been directly impacted by the govt shutdown! While it was likely very nice to have your husband around the house for the last couple of weeks, I am guessing that you're a bit happy to have the house to yourself during the day again. I read that furloughed employees will receive backpay. I sure hope that's true for your family. Thank you! And yes, I admit, I heaved a sigh of relief to be alone in my house today. The tea sounds lovely. I'm not a big tea drinker, but smell alone would probably be worth it. I swing between tea, coffee and cocoa this time of year. I find tea to be especially nice when I don't want the heavier flavor of coffee or cocoa. Sometimes I just simmer some spices on the stove, for the aroma alone. I was excited to find tea at the Dollar Store until I realized that each tea bag is 1 oz. not the usual 2. While the Dollar store tea is still a good price it involves the production and disposal of twice as much packaging. I have been purchasing my tea art Rite-aid. Full sized tea bags at a reasonable price. you're right -- the teabags at Dollar Tree are smaller than Lipton or Red Rose. Also, I find a great deal on plain tea at Albertson's about once per year, during a 10 for $10 sale. Grocery Outlet has had tea bags reasonably priced, as well. I'll check out Rite Aid's tea, the next time I'm there. Thanks for that info! Thanks for this! The orange spice tea I like (Higgins and Burke) has been really hard to find locally and I was thinking of ordering it online! Oh good! I'm so glad! Hope you enjoy the tea. I love that you freeze all the zest from your oranges! There is absolutely no good reason to ever toss away a rind with all that lovely zest still on the outside. To portion it out, do you freeze it in ice cube trays or something like that? I've never heard of orange-infused vinegar. Do you typically use it in a salad? Even though I'm loving the current summer weather, your posts that I've been reading about hot teas and soups are making my palate lust for autumn! After I've run the zest through the food processor, and it's in tiny bits, I store in the freezer in plastic tubs. It doesn't have a high water content, so it breaks apart easily, even when frozen. I sometimes have to chip at it, with a fork or something like that, but not difficult by any means. Oh, I use orange-infused vinegar as a household cleaner. I infuse whole cloves and chunks of orange peel in white vinegar for several weeks, then strain. I dilute it half and half with water. It makes a great cleaner for the kitchen vinyl flooring, and good daily spray for the bathtub. That sometimes happens to me too. I think of it as season confusion. I'll get myself all worked up for fall menus, in the middle of summer.Then I'll have tor remind myself to get back into the present and enjoy what we've been given now! Oooh, what a lovely idea for a frugal and natural cleanser! I once had a roommate who loved to say that the kitchen wasn't clean until it smelled like citrus. :) I found your cleaner recipe in a different post, so I'll definitely give this a try!